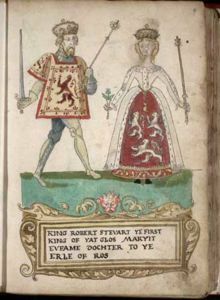 Biography*: Walter Stewart, Earl of Atholl, Strathearn and Caithness (died 26 March 1437) was a Scottish nobleman, the son of Robert II of Scotland. Stewart was an enthusiastic advocate of the ransom and return to Scotland of the future king in exile, James I, in 1424. In 1425 he served as a member of the jury of 21 which tried and executed his nephew Murdoch Stewart, 2nd Duke of Albany. Eventually however Atholl turned against the King and conspired in his assassination in 1437. He was tried for murder and was executed after 3 days of gruesome torture. He was a son of Robert II of Scotland by his second wife Euphemia de Ross, daughter of Aodh, Earl of Ross. He was also a younger half-brother of Robert III of Scotland and an uncle of the above mentioned James I of Scotland. In 1390, his niece Euphemia resigned to him the Earldom of Caithness. In 1404, he was created Earl of Atholl. He was energetic in retrieving his nephew James I from the Kingdom of England, which was accomplished in 1424, and was a member of the jury which tried his cousin Murdoch Stewart, 2nd Duke of Albany, and which culminated in the execution of Albany and two of his sons. He was made Great Justiciar of Scotland and Earl of Strathearn, with such title being taken from Malise Graham, who subsequently became the Earl of Menteith in 1427. He resigned Caithness to his son Alan in 1428, but regained it on Alan's death without issue in 1431. The depth of his loyalties to James is unclear. The chronicler Buchanan (1582) saw in his efforts to return James to Scotland and support him against Albany and his children a deep-laid plan for those two branches of the House of Stewart to destroy each other — and clear his own way to the throne, reviving the old charge of illegitimacy against his half-brother Robert III. Others aver that it was the imprisonment and subsequent death of his son David that turned him against the king. Whatever the cause of Stewart's rage against the King, he joined with his grandson Robert Stewart, Master of Atholl and Sir Robert Graham in a conspiracy against James I, which assassinated the king on 20 February 1437. Robert Stewart unbarred the doors to the royal apartments, permitting assassins to enter the King's lodging at the Dominican Friars in Perth. The King hid himself under the floorboards, only to be discovered by Sir Robert Graham, who personally finished him off. [S746] Wikipedia, online http://Wikipedia.com, http://en.wikipedia.org/wiki/Walter_Stewart,_Earl_of_Atholl. Biography*: Euphemia de Ross (died 1386) was the second wife and first Queen consort of Robert II of Scotland. She was a daughter of Aodh, Earl of Ross and Margaret de Graham, Hugh's 2nd wife and daughter of Sir David de Graham of Montrose. She first married John Randolph, 3rd Earl of Moray but the marriage was childless. Her husband died in 1346 and she remained a widow for nine years. On May 2, 1355, Euphemia married Robert Stewart, sole son of Walter Stewart, 6th High Steward of Scotland and Marjorie Bruce. Marjorie was a daughter of Robert I of Scotland and his first wife Isabella of Mar. It appears that there was an obstacle of affinty to this second marriage, and a papal dispensation by Pope Innocent VI was required for it to be recognized by the Roman Catholic Church. However there is some doubt about exactly what the affinity between them was. Biography*: Elizabeth Mure (died before May 1355) was mistress and then wife of Robert, High Steward of Scotland, and Guardian of Scotland (1338–1341 and from October 1346), who later became King Robert II of Scotland. Elizabeth Mure (Muir) was said to be born at Rowallan Castle. Her parents were Sir Adam Mure of Rowallan, Ayrshire and Janet Mure. She initially became the Steward's mistress. He married her in 1336 but the marriage was criticised as uncanonical, so he remarried her in 1349 following a papal dispensation dated at Avignon 22 November 1347. She died before her husband inherited the crown at the rather advanced age of 54, and he later re-married (Papal Dispensation dated 2 May 1355). On 27 March 1371, "The Lord John (who later took the title of King Robert III, changing his name because of what he saw as John de Baliol's unpatriotic desecration of the name John), Earl of Carrick and Steward of Scotland, first-born son of King Robert II" was declared heir to the Crown by Parliament in Scone Abbey. They had at least ten children, with some accounts saying as many as thirteen. Doubts about the validity of her marriage led to family disputes over her children's right to the crown. Johanna (Jean) Stewart, married firstly, Sir John Keith, secondly, Sir John Lyon, and thirdly in 1384, Sir James Sandilands. Biography*: James, 5th High Steward of Scotland (died 16 July 1309) was High Steward of Scotland and a Guardian of Scotland during the First Interregnum. James was a son of Alexander Stewart, 4th High Steward of Scotland; the identity of Alexander's wife is unknown. The date of his birth is not certainly known and some sources have placed it, on no good evidence, as early as 1243. This is now thought to be unlikely. Firstly, James's father is known to have planned a pilgrimage to the shrine of Saint James of Compostella in 1252 or after, so that James would probably have been born after this. Secondly, James's Christian name was an unusual one, uncommon in Scotland in the 13th century and not a traditional name in the Stewart family where Walter and Alan were favoured. It is therefore quite possible that he was not Alexander's eldest son, but rather the eldest surviving son. For these reasons, and also the fact of his son and successor Walter Stewart being described as a "beardless lad" around 1314 in John Barbour's The Brus, it is proposed that James was born around 1260. In 1286 James was chosen as one of the six Guardians of Scotland. He subsequently submitted to King Edward I of England on 9 July 1297, and was one of the auditors for the competitor, Robert Bruce, 5th Lord of Annandale. However, during the Wars of Scottish Independence he joined Sir William Wallace. After Wallace's defeat at the Battle of Falkirk in 1298, he gave his support to Robert Bruce, later King Robert I of Scotland, grandson of the competitor. Walter, 6th High Steward (1293–1326) who married King Robert I's daughter, Marjorie Bruce. Sir John, killed 14 October 1318 at the battle of Dundalk. Sir James Stewart of Durisdeer, Tutor to his nephew, the future King Robert II of Scotland, in 1327. Egidia Stewart, who married Sir Alexander de Menzies, of Durisdeer. [S746] Wikipedia, online http://Wikipedia.com, http://en.wikipedia.org/wiki/James_Stewart,_5th_High_Steward_of_Scotland. [S746] Wikipedia, online http://Wikipedia.com, https://en.wikipedia.org/wiki/Walter_Stewart,_6th_High_Steward_of_Scotland. Biography*: She was also known as Marjorie. She succeeded to the title of 3rd Countess of Carrick in 1256, suo jure. From 1271, her married name became le Brus. [S746] Wikipedia, online http://Wikipedia.com, http://en.wikipedia.org/wiki/Marjorie,_Countess_of_Carrick. Biography*: William de Brus, 3rd Lord of Annandale (died 16 July 1212), was the second but eldest surviving son of Robert de Brus, 2nd Lord of Annandale. His elder brother, Robert III de Brus, predeceased their father, never holding the lordship of Annandale. William de Brus thus succeeded his father when the latter died in 1194. William de Brus possessed large estates in the north of England. He obtained from King John, the grant of a weekly market at Hartlepool, and granted lands to the canons of Gisburn. Very little else is known about William's activities. He makes a few appearances in the English government records and witnessed a charter of King William of Scotland. [S746] Wikipedia, online http://Wikipedia.com, http://en.wikipedia.org/wiki/William_de_Brus,_3rd_Lord_of_Annandale.